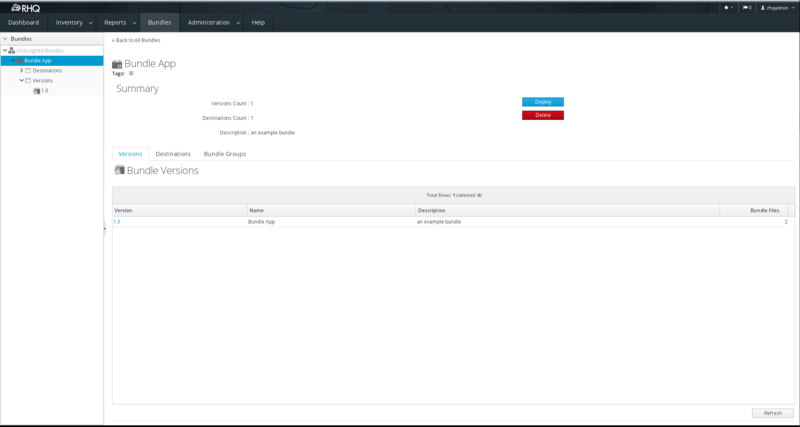 RHQ is an enterprise management solution for JBoss middleware projects, Tomcat, Apache Web Server, and numerous other server-side applications. RHQ provides administration, monitoring, alerting, operational control and configuration in an enterprise setting with fine-grained security and an advanced extension model. All screenshots are taken from RHQ 4.13. 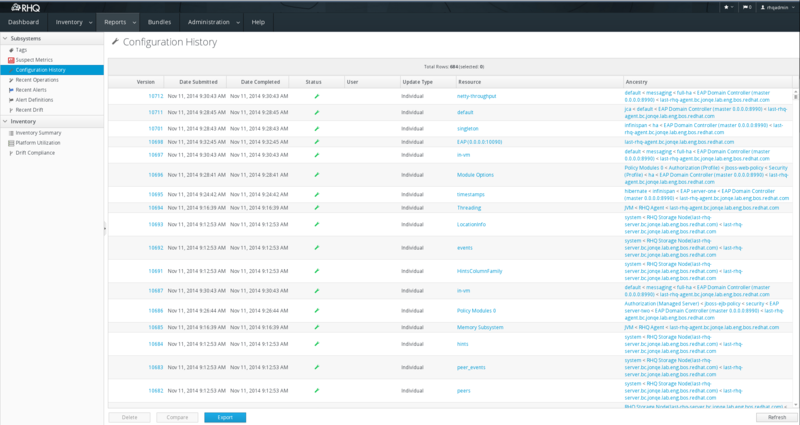 Inventory is responsible for finding and tracking the platforms, servers and services that will be managed using RHQ. This system provides auto-discovery for easier deployment and thorough models of deployed systems and applications. It provides the central administrator the ability to configure which features will be used on which targeted services. 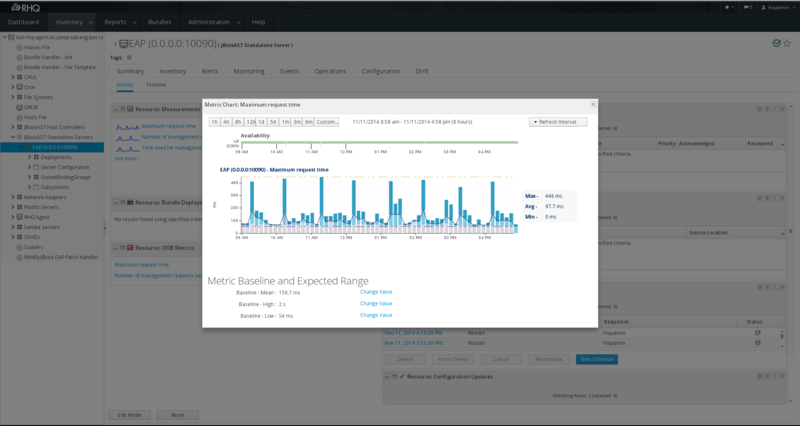 Configuration supports reading, updating, and tracking changes to the settings for managed resources. 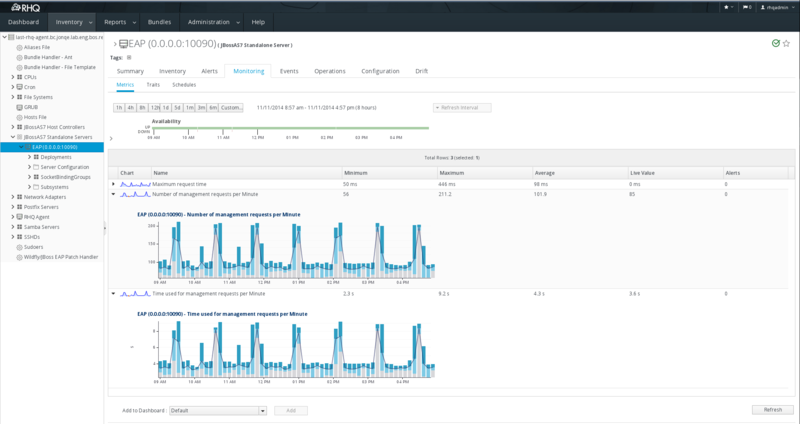 These configuration changes can be tracked historical and even detect changes made outside the system while providing an audited history and the ability to roll back to previous versions for supported resources. Monitoring manages the collection of statistics and state for managed products and the setup of collection intervals and details. This system also provides running baselines to show metrics that go out of their normal ranges. The Alerts feature set integrates with other subsystems to provide notifications of user defined conditions. This can be utilized to notify administrators of performance problems or failed operations. Complex conditions allow for detailed alert situations to be modelled while dampening allows for the right semantics to occur before notification of administrators occur. Operations offer the ability to execute actions against managed resources in the inventory. These operations depend on the resource, but can include actions such as stop, start and restart as well as clearing caches or gathering detailed operation information. 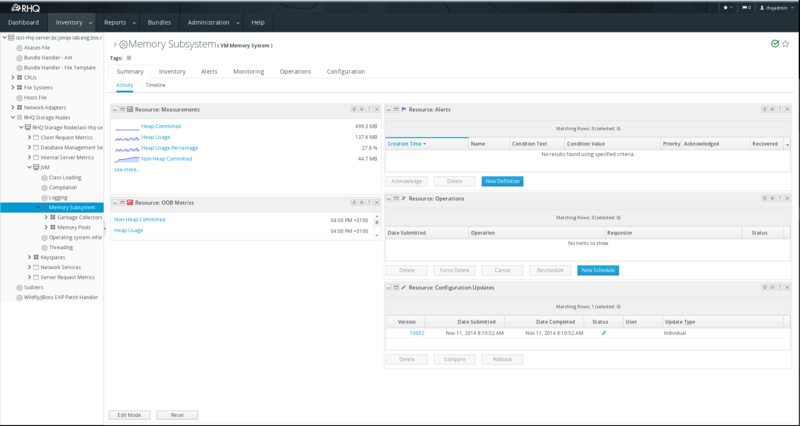 Provisioning Also known as the “Bundle” subsystem, RHQ’s Provisioning feature allows you to deploy packages of software to remote machines, thus allowing you to install and upgrade software. 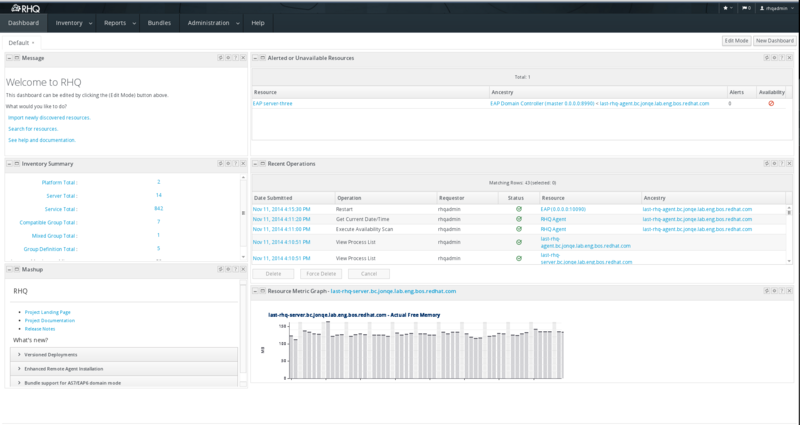 We also support drift detection, provisioning of content, creating and working with groups of resources, events (logs), etc. For richer list of features goto the wiki. For more basic info I suggest visiting FAQ. If you wish to get involved as a contributor to RHQ, please visit #rhq channel on Freenode IRC and get to know people. This channel is logged and the history is here. If you want to contribute to the source repository, please fork it into your own repository and send pull-requests afterwards. Each Pull-Request should be “backed” by an entry in Bugzilla. Please add the Bugzilla issue number to the Pull-Request. In order to boot into the domain and grasp the nomenclature we use, good start is the RHQ wikipage. You can also help the community by answering the questions either on our own RHQ forum or on StackOverflow. Here is the happy path for building the RHQ, it assumes Maven, JDK7 and Postgres to be installed. There should be also precreated rhq database and rhqadmin user in Postgres DB. Also see README.adoc on github!